My friends warmly greeted me in the hall this morning on our way to the Easter breakfast at school. 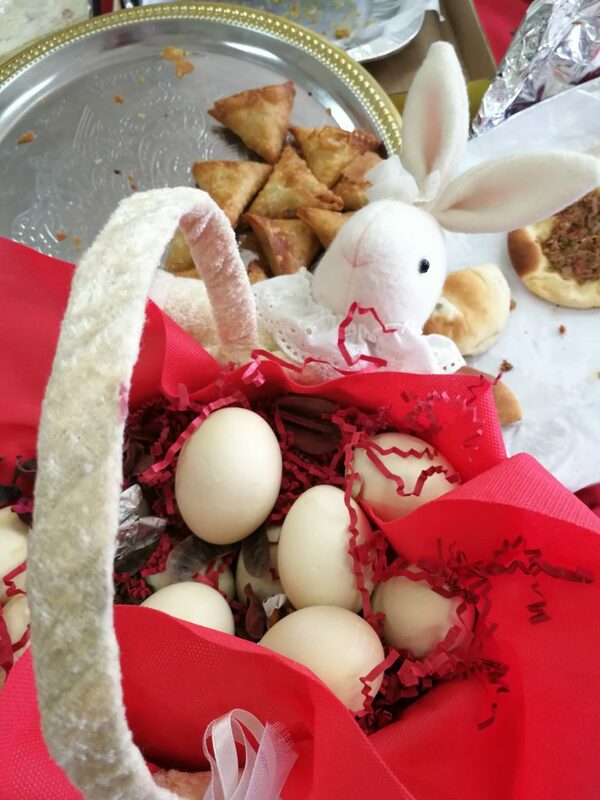 They spoke the words ‘Happy Easter’ with slow and deliberate pronunciation. Maybe it’s like the way I say, “Eid Mubarak,” to them during Muslim holy days, trying to get the syllables in the correct order. 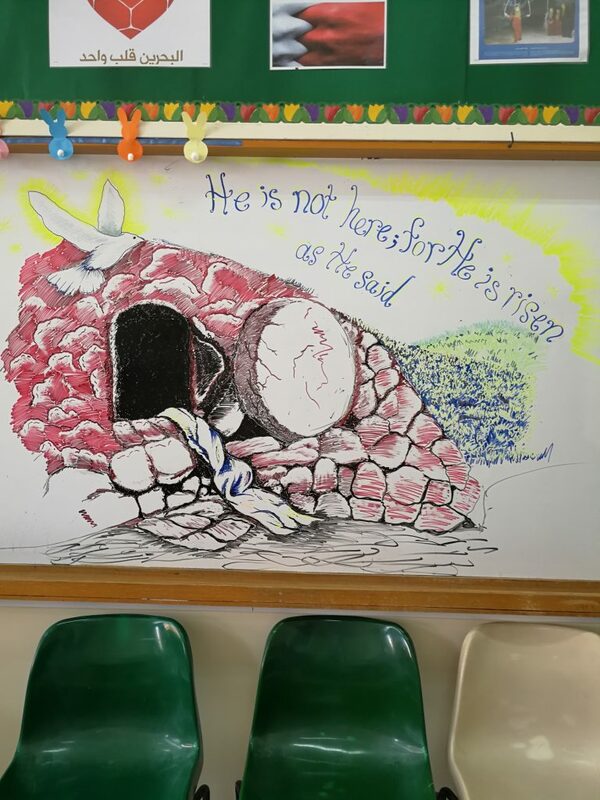 The Easter mural on the whiteboard, drawn by our Muslim art teacher. When I joined the Reformed Church in America at Emmanuel Reformed in Paramount, California, I was an 18-year-old college freshmen, excited to be part of a church that encouraged me to think, as well as feel. I was never afraid to ask hard questions of my college and career pastor Rev. Jerry Sittser. I was challenged from the pulpit each week by Rev. Harold Korver to study and discuss scripture and its relevance. It was a rich time to grow as a new disciple of Jesus. It was at that time that I began to hear about the work the RCA was doing in missions. Emmanuel had a rich relationship with missionaries in Chiapas, Mexico, and Ecuador and India, as well as Bahrain. I loved hearing what God was doing around the world. It was the first time in my life that I actively prayed for, supported, and even met amazing people of God who were doing his work around the world. Now fast forward almost forty years, and I am humbled and grateful to God that he has called Keith and me to join in this rich history. We recently spent a week in Bahrain, and the legacy of the Reformed Church is permeated in the mission there. Medical mission has deep roots in the RCA. American Mission Hospital in Bahrain was started by RCA missionary Samuel Zwemer over 100 years ago. Christian Medical College and Hospital in Vellore, India, now one of Asia’s foremost teaching hospitals, was started in 1918 by Ida Scudder, a third-generation RCA medical missionary. That quote, taken from the RCA’s Medical Mission page, speaks volumes about what we experienced when we went to visit. The American Mission Hospital is respected in Bahrain. Men and women of different faiths and nationalities work together to bring healing in Christ’s name to people of all walks of life. While we were there, Appu introduced Keith to many of the people who work in many different departments all around the hospital and clinic. I too was able to meet many of these doctors, nurses, receptionists, couriers, office and maintenance workers, and more. This was Dr. Ida S. Scudder they were referring to, the doctor–along with generations of her family–whom I had heard so much about as a young person. These two Indian doctors, now working in Bahrain, had studied medicine at the Christian Medical College and Hospital in Vellore founded by Dr. Ida. Praise be to God that the Reformed Church in America (Dr. Ida’s church) has faithfully served in global missions for over 200 years. We were so proud and humbled at that moment to be members of the RCA. This morning we worshiped with the people of Newkirk Reformed Church. Their women’s chorus sang these words, “Raised in His power, the weak become strong…”, and I was reminded yet again how humbled we are to be asked to join in this work. We can’t do it on our own, but God is good. God is faithful. And is there anything too difficult for God? We have had an amazing week in Bahrain. We have only one more day here, and then we will head back to Iowa to finish raising support. We have eaten too much delicious food, and we have relished even more in the rich fellowship we are having with new friends. We will definitely be sharing more later. You can see pictures of our trip on Flickr.